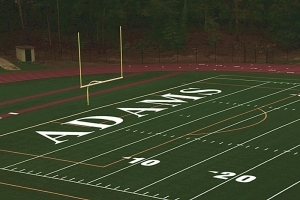 Adams Stadium is playing host to the 2018 Trail to the Title Middle School Football Playoffs semifinals on Saturday at 10:30 am (Bethune vs. Henderson) and 12:30 pm (Tucker vs. Cedar Grove). Coach James Holloway’s Henderson Cougars made program history with a big 10-0 win over previously undefeated Lithonia Bulldogs in the first round of the Trail to the Title Playoffs at Avondale Stadium on Saturday to advance past the first round for the first time. The Cougars had lost all five of its previous first round playoff games, including its Region championship season in 2015, despite reaching the playoffs four of the past five seasons. Henderson (6-1) struck with just 24 seconds left in the first quarter as quarterback Allen Hollmon connected with Jayden Guerrero for a 19-yard touchdown pass. Hollmon completed the scoring as he kept the ball to run in for the two-point conversion to make it 8-0. The game continued to be a defensive struggle as both teams could not find the end zone the rest of the way. Isaiah McBean sealed the 10-0 win with 5:23 to play in the game as he broke through for a tackle for a loss in the end zone to pick up a safety for the Cougars. Lithonia ends the season 6-1 and as the Region 3 champ. Henderson moves on to face Holloway’s former school Bethune (6-1), a 38-0 winner over Bethune (4-3), in the semifinals at 10:30 am at Adams Stadium on Saturday (Oct. 27). Holloway led the Lions to a pair of Trail to the Title runners-up finishes in 2008 and 2011. Both teams are currently receiving honorable mention honors from the B2C (Born to Compete) Prime 21 Rankings. A big defensive stand inside their own 25 following a fumble secured an exciting 14-12 first round victory for the Cedar Grove Saints over the previously undefeated Stephenson Jaguars on Saturday at North DeKalb Stadium. After fumbling away the ball on its own 25, Cedar Grove (5-2) played tough defense as it had throughout the game to force Stephenson to turn the ball over on downs. A.J. Green broke through the Stephenson front for a critical sack on third down to put Stephenson in a fourth and very long. The Saints held and with the win tied Stephenson with their ninth Trail to the Title semifinal berth. Cedar Grove’s defense came up big in the first half too with a pair of fumble returns for touchdowns. Green was the culprit on the first as he scooped up the loss football and returned it 40 yards for the score. Jamar Graham added the two-point conversion to make it an 8-0 game. Stephenson answered on the ensuing kickoff by returning it for a touchdown. A two-point try was no good, but the lead was down to 8-6. Later in the first half Cedar Grove’s Alvin Williams met a Jaguars’ running back in a running lane and held him while Antonio Colbert knocked the football loose. Thamon Spinx reeled in the loose football and scrambled 23 yards for the touchdown to make it a 14-6 lead heading into the half. Stephenson scored in the third quarter to close the gap to 14-12 as once again the two-point conversion failed against the tough Saints’ defense. Stephenson, the Region 2 champion, finishes its season at 6-1. The win over Stephenson (No. 2 B2C Prime 21) gives the Saints two wins over ranked teams, including No. 4 Tucker earlier this season. Cedar Grove moves on to the semifinals to face defending Trail to the Title champions Tucker Tigers (6-1) for the fifth consecutive year. Cedar Grove knocked off Tucker in the 2014 and 2015 championship game for back-to-back titles and broke the Tigers 33-game regular season win streak back in Week 2 with a 16-8 win. The two square off at 12:30 pm at Adams Stadium on Saturday (Oct. 27). The Bethune Lions rolled into their second consecutive Trail to the Title semifinals by a score of 38-0 over the Renfroe Bulldogs at Avondale Stadium. Bernard Mack was the big play guy for the Lions (6-1), who are an honorable mention for the B2C Prime 21 Poll, as he scored three touchdowns on offense and had a team-high six tackles and a sack on defense. He had 70 yards rushing and two of his touchdowns on the ground and added 45 yards receiving with another score. Quarterback Isaiah Logan threw for 65 yards and a touchdown and ran for another score to go with one rushing touchdown each by Jeremiah Curtis (55 yards on 4 carries) and Letrelle Richardson. Bethune is making its sixth semifinal appearance in eight playoff appearances as the Lions line up against the Henderson Cougars (6-1) at 10:30 am on Saturday at Adams Stadium. It is the first ever playoff meeting between the two programs. Jayqunn Billingsley had another big time performance for the Tigers as Tucker (6-1) advanced to the Trail to the Title Semifinals for the sixth consecutive season with a 36-8 win over the Redan Raiders (4-3) at North DeKalb Stadium. Billingsley recorded 10 tackles on the defensive side of the ball, six for a loss, and when on offense he rushed for 83 yards and touchdown in the game. Bryce Bowens got the Tigers off and running by returning the opening kickoff for a touchdown. He also added another rushing touchdown and picked off two passes on defense. Tucker, the No. 4 team in the B2C Prime 21 Poll, heads into the semifinals to take on Cedar Grove (5-2) at 12:30 pm at Adams Stadium on Saturday (Oct. 27). Tucker lost to Cedar Grove 16-8 in Week 2 this season to break a 33-game regular season win streak for the Tigers. Tucker has won the past two playoff matchups, including last season’s 14-12 first round victory, after losing in the Championship round in 2014 and 2015, to even the series at 2-2 in the playoffs.